From the Adam Sandler-centric Billy Madison to the one-two combination of 21 and 22 Jump Street, the idea of grown adults returning to high school is a concept that has played out in plenty of comedies over the years. Returning to the well once more is Night School, the new Kevin Hart vehicle (or HartBeat Production, according to a pre-credit logo) that does precious little to distinguish itself from the class. 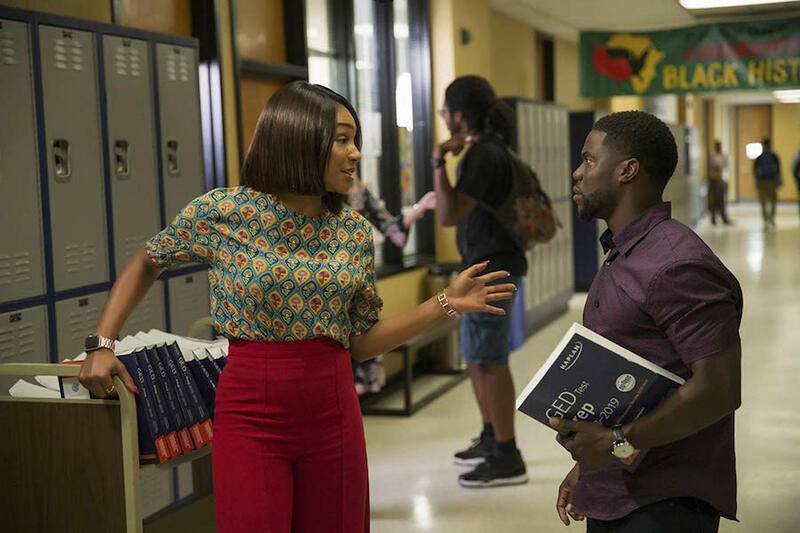 Along with co-star Tiffany Haddish, Hart brings his typical level of charm and dedication to the film but even with six credited writers on board, there just aren’t enough laughs built in to the script to make this trip back to school worth taking. Hart stars as Teddy Walker, a barbecue grill salesman looking to move into a career in finance to keep pace with his successful fiancé Lisa (Megalyn Echikunwoke), despite the fact that he lacks a high school diploma. With the hopes that he can charm his way into a work-free GED, he attends night school classes at the same school he dropped out of years prior but is met head-on by the no-nonsense instructor Carrie (Tiffany Haddish). Together with his eccentric group of classmates, Teddy must learn to overcome the same obstacles that precluded him all those years ago. The film gets off to a promising start, as director Malcolm D. Lee sets Teddy up as a likable guy who seems to have peaked early on in life, but each subsequent character is given less and less dimension by comparison. By the time we get to the first night school class, supporting players like Rob Riggle and Mary Lynn Rajskub are relegated to one or two introductory lines that don’t create enough of a foundation upon which to build clever jokes. The movie’s would-be climax, a late-night school break-in to steal answers to a practice test, spreads its humor thin across half a dozen characters and ends with a gross-out gag that feels out of place and off-putting. Most of the laughs that land come from the verbal sparring between Hart and Haddish that’s established during their first scene together, in which she refers to him as a “burnt leprechaun”. As is typical for most Hart comedies, his diminutive stature is the center of quite a few jokes; I also appreciated the imposing low angles that cinematographer Greg Gardiner used to juxtapose the height difference between Hart and the film’s more domineering characters. This is especially evident in an early scene with the strict principal played by SNL‘s Taran Killam, whose bat-touting antics seem to be a riff on the Morgan Freeman character from Lean On Me. Like its main character, the biggest problem that Night School faces is a critical lack of focus. Clearly the film is going for a Breakfast Club vibe where each character has their own dilemma to solve but with two major comedic talents at the forefront, there isn’t enough screen time for a whole class of students. Perhaps if Teddy had been paired with just one classmate, like the one played by Romany Malco (the two shared a hilarious scene in The 40-Year-Old Virgin), then there could have been some tighter comedic writing. Night School is good-natured and has an endearing message at its core but as a laugh-out-loud comedy, it doesn’t quite make the grade. Venom, starring Tom Hardy and Michelle Williams, is the latest Sony-backed Marvel superhero movie that focuses on a journalist who gains superpowers after coming in contact with an extraterrestrial parasite. A Star is Born, starring Bradley Cooper and Lady Gaga, is the third remake of the 1937 original film that follows the romance that develops between a road-worn country musician and an up-and-coming singer. Also opening at Cinema Center this weekend is Blaze, starring Ben Dickey and Arrested Development‘s Alia Shawkat, which is a new biopic directed by Ethan Hawke that covers the life of country musician Blaze Foley.